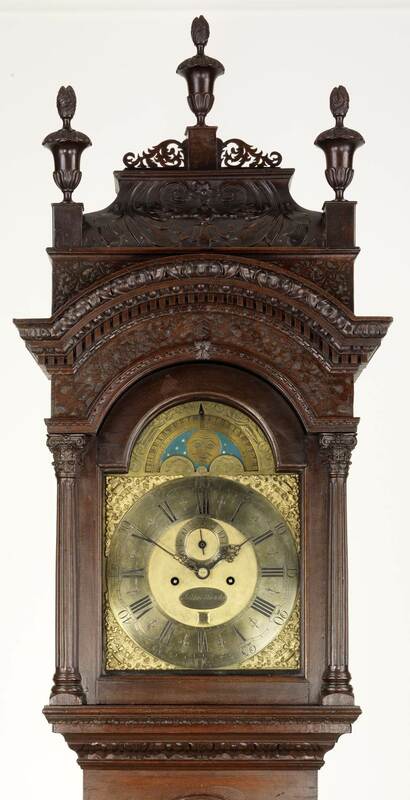 Sponsored and organized by the National Association of Watch & Clock Collectors, the symposium will be the first at Winterthur to focus exclusively on the museum’s horological holdings. A roster of eminent speakers will address important clocks and watches in the collection, highlighting their makers, regions, craftsmanship, and cultural significance. One of America’s top-rated house museums, Winterthur boasts a premier collection of 90,000 decorative and fine arts objects made or used in this country between 1640 and 1860. Envisioned and created by Henry Francis du Pont (1880-1969), the 175-room house presides over a 1,000-acre estate in Delaware’s Brandywine Valley. 60 acres of gardens offer additional delights for visitors throughout the seasons. Nearby are other important museums, gardens and cultural attractions. H.F. du Pont had a special interest in clocks and timekeeping. He acquired many fine examples for the museum during his lifetime. Since his passing, more clocks have been added to the collection which now numbers more than 100. Within the museum galleries is a faithful reconstruction of the clock and wood-working shop of the Dominy family who worked on Long Island from the mid 1700’s to the mid 1800’s. This conference marks a new chapter in the 30-year history of these annual NAWCC educational events. Beginning in 2016, they will convene at renowned institutions with important timekeepers, forging new links between those museums and one of the world’s foremost horology associations. Winterthur Museum Tour:Standard 1-hour general tours of the house museum are included in your registration, but must be arranged in advance and directly with the Museum. The museum also offers special 2-hour clock tours for $50 person, not during the times of the presentations, and these require advance signups, too. Due to the museums’s many small rooms full of important objects and artworks, no self-guided tours are permitted. Call 800-448-3883 for museum tours, but not for NAWCC symposium registration or information. Please visit www.clocksatwinterthur.com for more information. Lodging: Because the entire program takes place at the Winterthur Museum and at the Wilmington Country Club, there is no host hotel. Please see the “Lodging” page of the symposium website for a list of several nearby hotels and the discount rates they offer to our group. Your registration fees are devoted entirely to direct symposium costs including food, facilities rental, technical support, and speaker travel and lodging. All speakers have waived honorariums, and none are compensated for research, preparations, or presentations. Symposium organizers and workers are all volunteers. Registration deadline is September 15, no refunds after that date.